Straights - Delicious, Chic and Unforgettable. 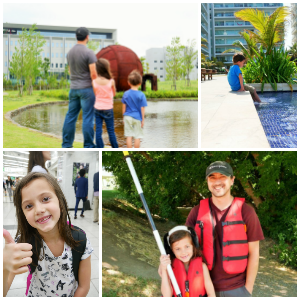 Recently I did a press trip to Houston sponsored through the GoHouston! As always all opinions are my own. 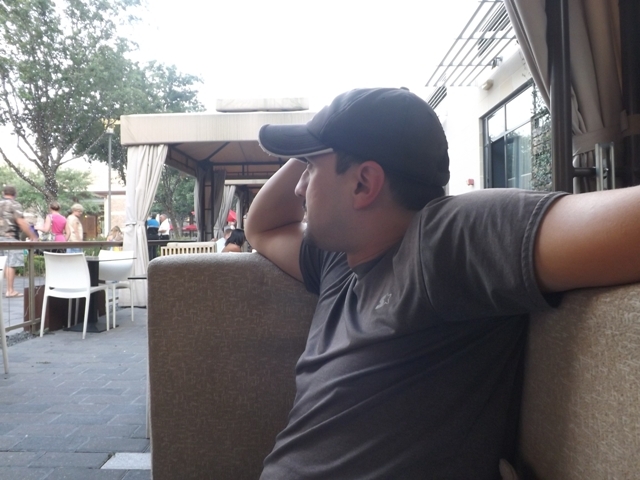 While on our amazing trip to Houston we were invited to dine at STRAITS Restaurant. I wasn't familiar with the cuisine from Singapore and I was afraid it wouldn't be quite to my liking. Wow if I had only known how narrow minded and wrong I was. 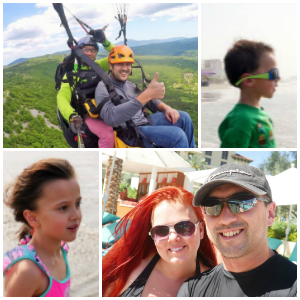 If it weren't for this opportunity, my husband and I on our own probably would have chosen a different restaurant and missed out on such a wonderful dining experience. As soon as we walked in we were greeted by an incredibly friendly staff and seated outside in one of their lovely cabanas. The air was a perfect temperature and City Centre had live music across the way... it was starting to feel like a scene from a romantic movie. My husband and I looked at the menu for a few minutes, but we were stuck between a few different options. 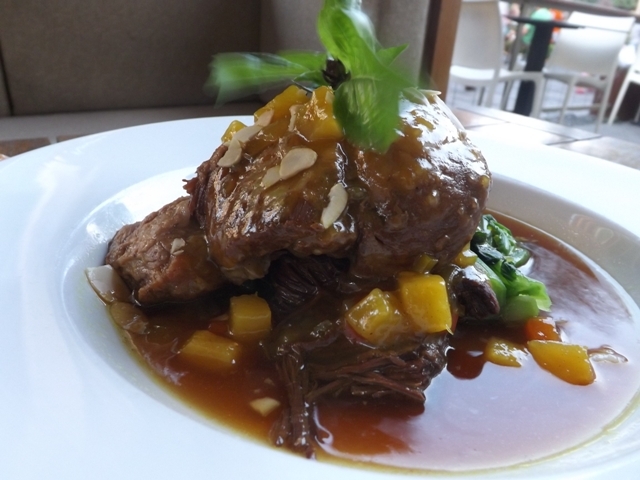 Vladimir our waiter suggested we choose the Tender Braised Asian Pork Pot Roast with Chinese Spinach & Pineapple Chutney. 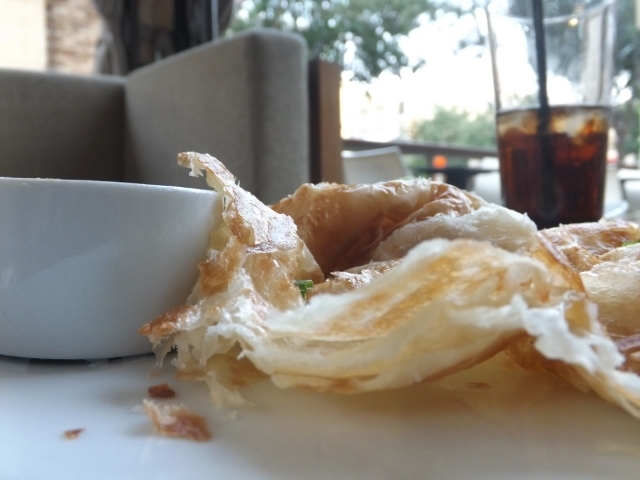 To say "he knew what he was talking about" would be an understatement, but before I get ahead of myself I can't forget to tell you about the Roti Prata. I can't believe I have been missing out on this my whole life. Do you see those crispy layers? That's heaven somewhere in the middle there. It's no secret that I am a carb fan, but this is on a whole other level that any other bread, pastry I have ever had. 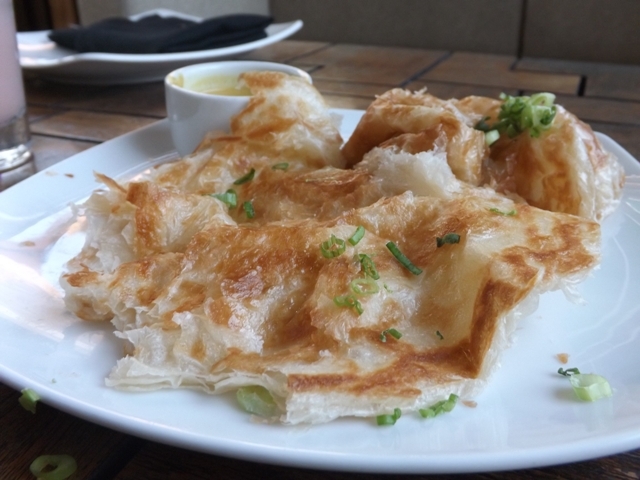 The Roti Prata comes with a curry that is also top notch, and you don't want to miss it. I loved this so much that I have now found a recipe online and plan on making this at home. Unfortunately we don't have a STRAITS Restaurant in Utah or you would find me there every week eating one of these. I will be sure to let you know how my homemade version turns out. 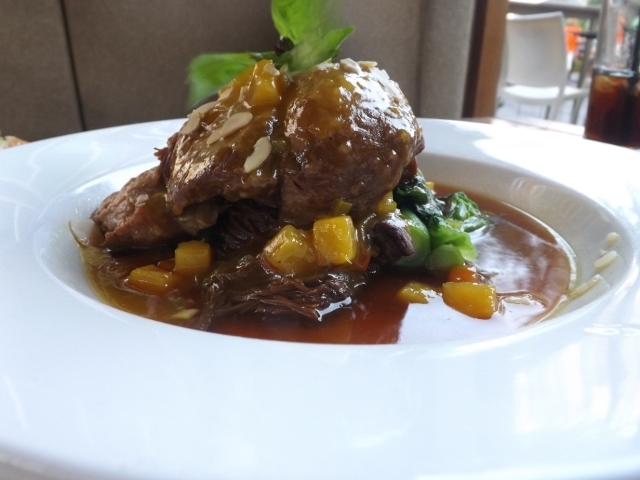 This was our main course; the Tender Braised Asian Pork Pot Roast with Chinese Spinach & Pineapple Chutney. My mouth is watering just thinking about it right now. Doesn't it look amazing, my pictures don't even do it justice. The combination of the Chutney and the Pot Roast flavors were heavenly. I swear they must have had this baby roasting all day, because it was a challenge for it not to melt before it even hit my tongue. I have never had such succulent and soft pork. And if you are looking to spend a little less, they encourage ordering dishes to share; family style. My husband and I shared this, and it was definitely enough for the both of us. 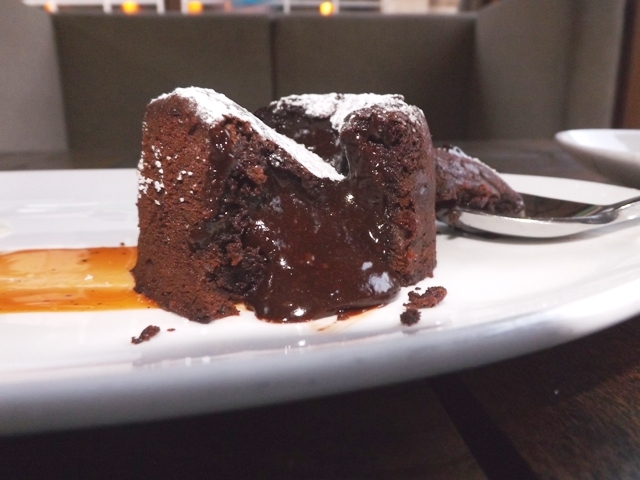 CHOCOLATE LAVA CAKE - I savored every last bite. The perfect complement to an amazing dinner. Slightly crunchy outer shell and rich warm chocolate on the inside that comes pouring out once you dig in for that first bite. If you prefer something with less chocolate (I will try not to judge) you could try the Cheesecake Egg Rolls, like my husband did. Super moist and rich cheesecake filling wrapped up and dusted with sugar. 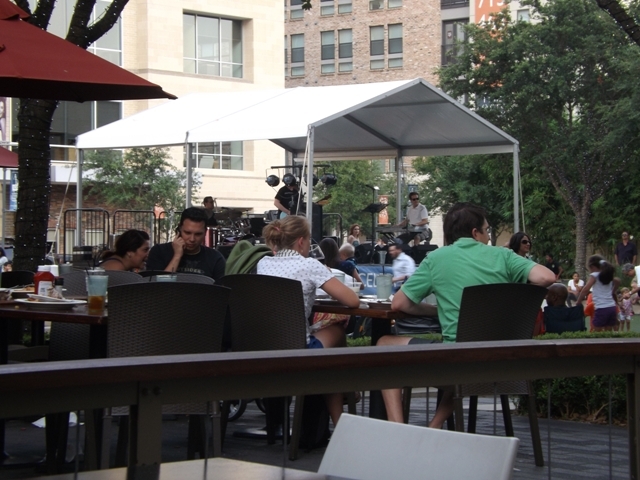 I would highly recommend sitting outside, I don't want to sound really old lol, but the music inside was really loud and nothing beats eating incredible food out in the fresh air. To give you an idea of how friendly they are STRAITS, the manager John came over to our table to make sure we were enjoying our meal, not because I was doing a review on the food, but because it's what he does. He lives for this restaurant and he genuinely wants to make sure every customer is happy, but this motto doesn't stop at the Houston location this is a huge part of the STRAITS every day. 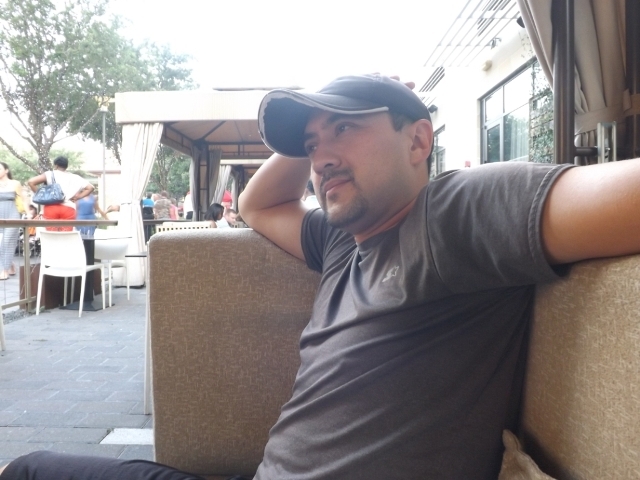 STRAITS is owned and operated by noted restaurateur, Chris Yeo. “It has always been my dream to have a restaurant to make people happy! Food is my passion and through food I make people smile!” he says. 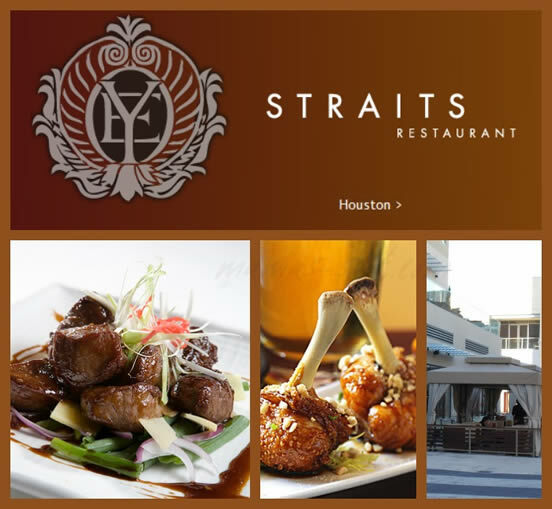 STRAITS Restaurant Group strives to leave a memorable impression by meeting every guest’s individual needs through great food, environment and genuine service. Few people know that Chris Yeo began his career as a hairdresser and was once more familiar with cutting hair than steaming dumplings. Had he not given up his blow-dryer for butane burners, foodies across the country wouldn’t have him to thank for bringing authentic yet modern Singaporean and Chinese cuisine to today’s dining landscape. So if you happen to be near or pass by Straits Restaurant take a lesson from me; step inside, meet some incredibly friendly people and open your palate to some of the best cuisine you will ever have. You can also check out their Facebook page for all their latest events and news.